Leather is both a natural and historic material used by artists for centuries. I have been working with leather for a few years, creating messenger bags, buckles, and similar items. However, I am also a painter. Paint can be used on many surfaces. I have used canvas, linen, hardboard, and wood and. In recent years, I have also used it on leather. When I turned to leather I knew I would need good quality and appropriately thick leather. After all, you don’t stretch leather like you do canvas or linen. It has to hold its shape particularly when placed within a picture frame, and I wouldn’t want to use any backing that would hide the fact that the painting indeed was on leather. The leather I chose is 4 mm thick or “10 ounce” in leather “lingo.” It’s not the sort of stuff you can bend easily. Working in leather revised my long-time interest in western culture. Yes, I was one of those teenagers who made an Indian war bonnet with turkey feathers dyed to resemble eagle feathers, beadwork, and rabbit fur tassels. 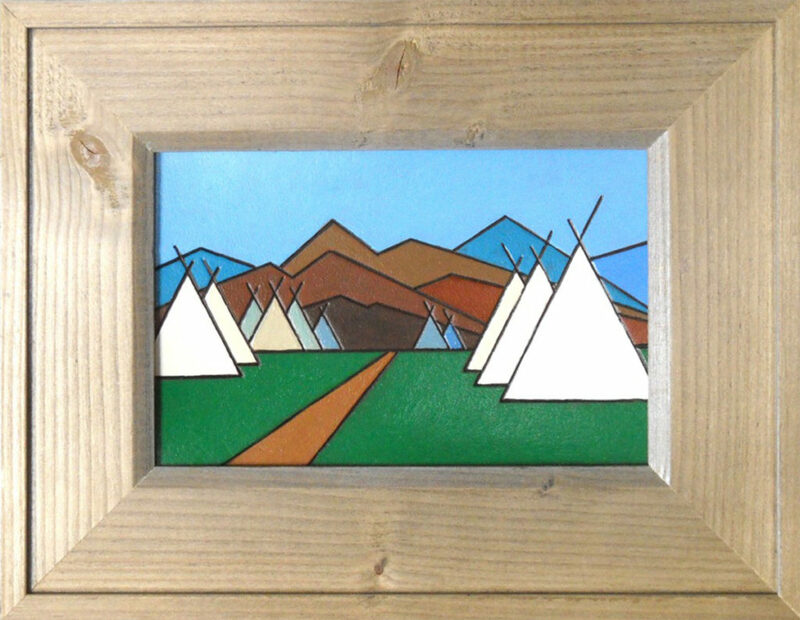 I selected a Native American theme for my first to-be-framed leather paintings, tepees. I began by making various sketches to find a suitable image. With my image chosen, my next step was to transfer the image to a special type of see-through tracing paper. That was then placed over a prepared piece of leather and the design traced into the leather. Leather is prepared by dampening it with water and leaving it overnight in a sealed plastic bag so that it will accept clean lines pressed into its surface. Next the lines were further incised using a swivel knife. 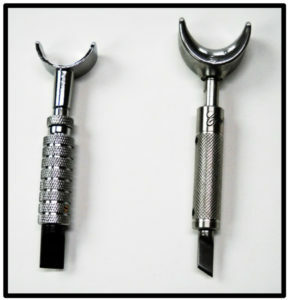 Below is a photo of my two swivel knives. As the name suggests, these sharp little darlings swivel so that one can cut curves. For this painting, however, I only needed to incise straight lines (way easier than curves!). After the design was incised into the leather, it was time to paint. I used not only paint created specifically for leather, but also leather dye and ink. And I didn’t paint all over the leather but left some areas natural. 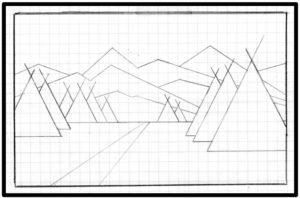 The ink was used for the straight lines. Below is the finished painting! It is 4 by 6 inches and is enclosed in a wooden frame. My leather paintings are for sale at River Art Gallery and Gifts (83 Webster Street, North Tonawanda, NY 14120). Check it out with some of the other local art at the art gallery in Tonawanda. Visit River Art Gallery and Gifts.